Today we celebrate our 3 months anniversary as a married couple. I wouldn’t argue that this celebration is a real achievement, but it is a very good reason for a little romance! And also a very good excuse to wear one of the most beautiful dresses ever! Today I wear a very special white gown, not only because it is a vegan couture wedding dress but mainly because it was designed by a friend of mine who I met in San Francisco. Daniela’s path crossed mine a few weeks ago at the so called Martini’s & Manolo drinks – yes, it was really called that way. We immediately connected really well as she had also come to America for love a few years ago. She told me about her experiences and lessons learned and how she found a way to pursue her dreams: starting her own vegan couture label for conscious fashionista’s. The fashion label is called Annaborgia. She manufactures the most glamorous eco-friendly dresses in the USA under the highest ethical standards. As I was obviously still irradiating my ‘new-bride’ glow (quote by Annaborgia), we soon decided that we should shoot the new bridal gowns in her collection. I was over the moon as I felt like a bride all over again! This wedding dress by Annaborgia makes you feel like the most beautiful girl in the world and let’s face is – that is just what a bride wants to be on her big W-day. But this dress is also perfect to keep a dominant place in the bride’s post wedding wardrobe as she could make a stunning appearance wearing it at any cocktail, garden or dinner party as well. This lovely maxi-dress is inspired by Stella McCartney, who Daniela sees as one of the most influential ‘cruelty-free’ and sustainable fashion designers. The fine and luxurious Japanese satin poly gives this dress a kind of casual ease. It is light and wrinkle free which makes it very easy to travel when you do a destination wedding. This glamorous white dress enables me to celebrate this three-months anniversary in style. It makes an elegant silhouette, is incredible comfortable in wearing and shines in simplicity. Because love is simple. No matter how many ‘rocks will be on the road’, I deeply love my husband and I will never leave his side. And I guess, if I keep wearing these type of dresses, he will never leave me either;)..! And that makes me the happiest wife alive! P.s. 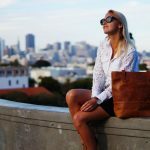 You might also like Top handle bag trend & If you are going to San Francisco! 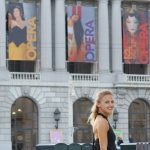 What to wear to the Opera in San Francisco?! Live your own authentic life with Freedom of Movement!